It was a lovely Thanksgiving weekend here. Despite an unpromising forecast the weather turned out crisp and sunny, just what one associates with this holiday. Unusually, I barely cooked this year. No houseful of company, just three days to relax, reconnect and reflect. Our low-key weekend included a visit to a local pumpkin patch and bringing home a big orange pumpkin and one of these Porcelain Doll pumpkins (yes, they’re pink!) to adorn the front porch. 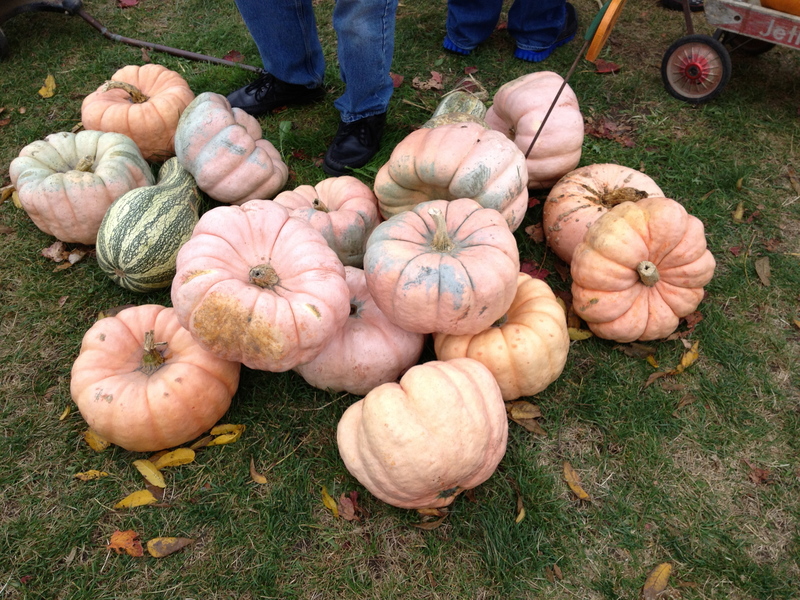 We also bought six adorable pie pumpkins that I roasted up on Monday. I wish I’d thought to take a picture of them. While I’m happy to see the stash of frozen puree in my freezer, it’s just not as picturesque as those little pumpkins. Thanksgiving is a time for family. Although I didn’t host a family dinner this year, I did have lots of opportunity to enjoy time with loved ones. I spent Friday evening at Jenn’s, helping her make pumpkin cookies and chatting. It gives me such pleasure to see my daughter cooking in her own kitchen, knowing that her love for baking started in mine. Those cookies were good, and I’m going to try her recipe one of these days. Sunday, we travelled to the small town my mother lives in and took her out for lunch in Sarnia. Afterwards, we went for a drive along the St. Clair River through the area she and my Dad used to live in. It was so nice to hear the stories from when they were a young couple starting out. On Thanksgiving Day, Meredith came by in the morning with the two Little Misses. It was a lovely visit of playing with toys, blowing bubbles and tricycle riding down the sidewalk. Before they arrived I made a batch of pumpkin and apple muffins, developing the recipe myself. Sad to say, they did not turn out at all, so I’ll have to rework the recipe. But no matter, seeing the little ones was food for the heart and soul. That afternoon, the Culinary Enthusiast and I went for a hike along walking trails in a large tract of woods just outside London. The colours were spectacular, the air bracing and the atmosphere serene. The long views of tree-covered hills and the deep chasm down to the wide river were stirring. 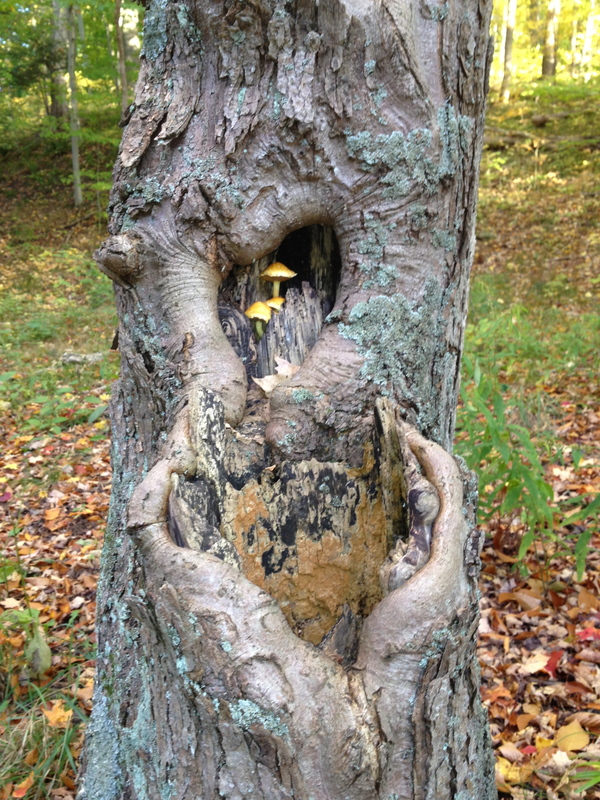 And up close, Nature provided some some surprises, like the mushrooms growing so perkily in the hollow of this tree. 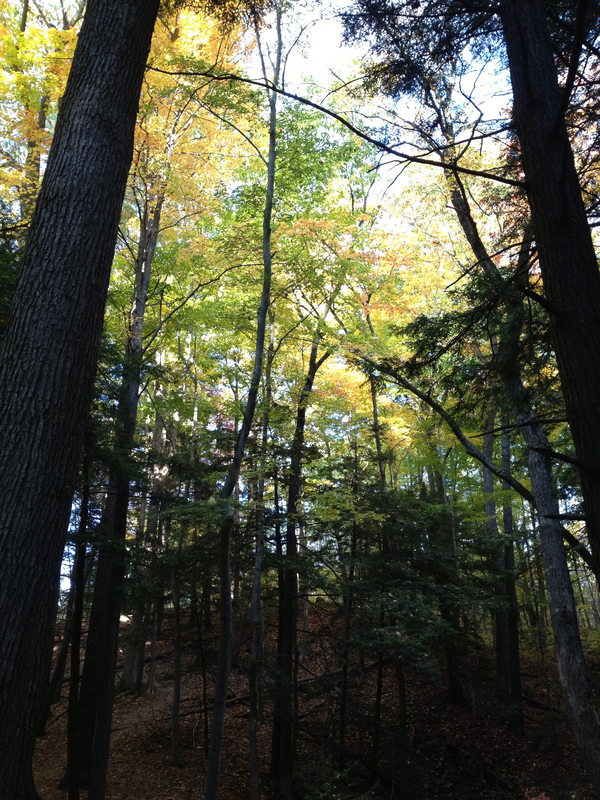 There’s a place inside these woods that I call ‘the cathedral’: towering trees, a leaf-covered ravine and a special stillness. A place where you can stand in awe and feel humbled by the beautiful nature that surrounds us. A place to deepen your connection to nature and the person you love who’s standing by your side, also taking in this beauty. 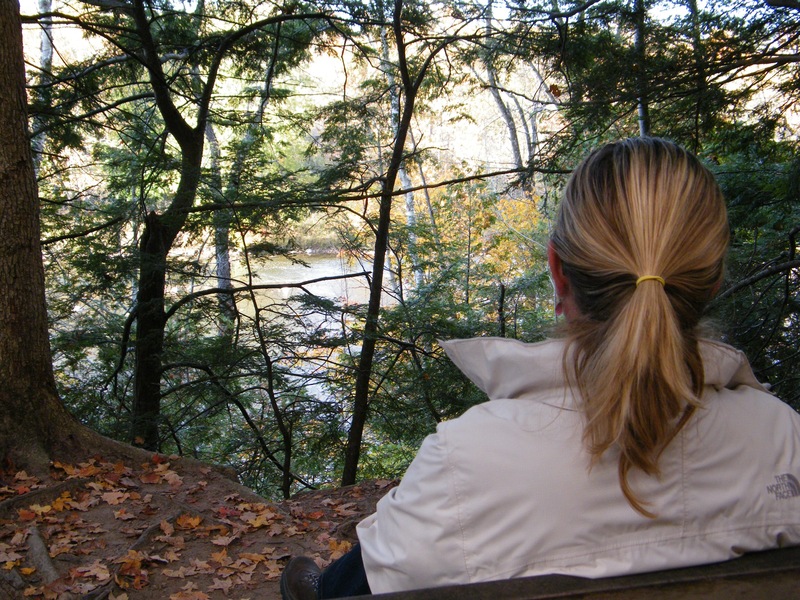 And nearby, a perfect place to sit on a bench overlooking the ravine down to the river, reflecting on all you’re thankful for in life. Yields about 3 cups puree per pumpkin, depending on their size. Pre-heat the oven to 350ºF. Cut whatever quantity of pie pumpkins you wish in half, scrape out the seeds and pulp, and roast cut side down on a parchment paper-lined baking sheet for 45 minutes to an hour or until the flesh is tender. Roasting cut side down allows them to steam and soften. If you cut them in smaller pieces, wrap the tray in foil before roasting. Set the tray on a wire rack to cool the pumpkin. Then scrape the pulp into a large bowl and puree using an immersion blender. Or, you can process it in a food processor. Note added 13 November 2016: For the first time today I tried draining the puree before freezing it. I lined a large fine-mesh strainer with paper towelling, then poured in the puree and let it sit over a large bowl. I was amazed at the quantity of juices that drainer from the puree. It’s an optional step, but one that yields a thicker result. It’s still not as thick as canned pumpkin, but it’s got such a delicious pumpkin flavour and that bright gold-orange colour is so cheerful! I far prefer to use my own homemade puree in pies, soups and other recipes. Freeze in the portion sizes you need for pumpkin pie and other recipes. My six pumpkins yielded enough puree for six pies (about 18 cups). I’m wishing now I’d made one of them this weekend, but there’s lots of pie in our future this winter. You’re right, John, I did miss having everyone over, but at the same time was grateful not to have to do all the cooking this year. I had a cold a week or two ago and haven’t quite gotten my energy back. However, that walk in the woods was wonderfully restorative. I’ll wish you a Happy Thanksgiving now, and then again at the end of November when you celebrate yours. After all, one can’t have too many Thanksgivings! There’s something about a pile of pumpkins that just makes me smile and feel happy. They’re a lovely symbol of my favourite time of year, and my entire family loves pumpkin pie. Thank you. I’m glad I had the chance to hike through the woods with you! 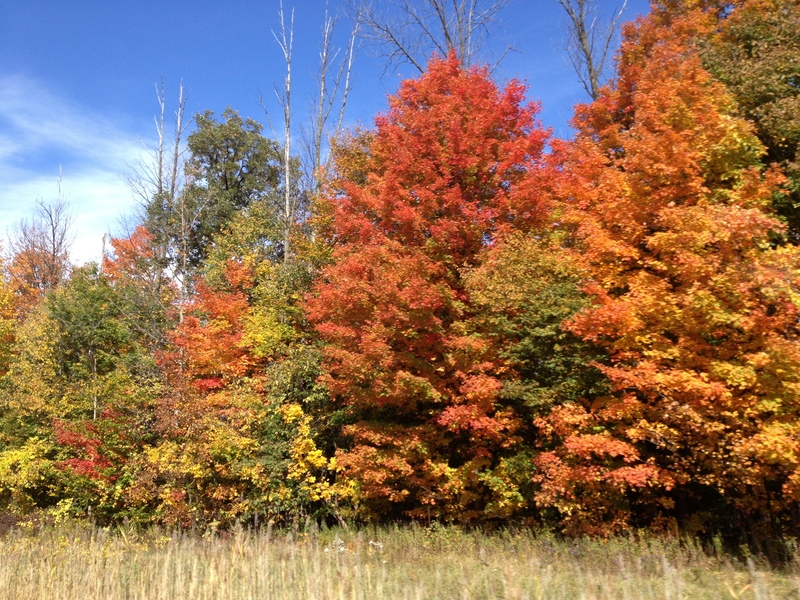 Eastern Canada has the full spectrum of autumn colors. Your photos give me a warm feeling that goes along with Thanksgiving. I have eaten so much pumpkin pie over the past couple of weeks- it is one vice that I will NOT give up!!! Thanks for sharing your Thanksgiving!!! Thank you for your lovely comment about my photos. I was happy to share my walk in the woods with you! As for pumpkin pie, I’m not so sure it’s a vice; perhaps a necessity of autumn? Yes, I couldn’t have said it better! It IS a necessity. You are so wise…. I didn’t recognize the shape in the tree as a heart until you mentioned it; thank you for helping me see it with new eyes. When my children left home it was good to see them launching into adulthood, as they should, but another one of life’s milestones to adapt to, especially when the last one left and my nest was empty. One of my greatest pleasures now is to have all three of my children gathered around my table and to see them enjoying each other’s company. And the little ones are the proverbial icing on the cake. 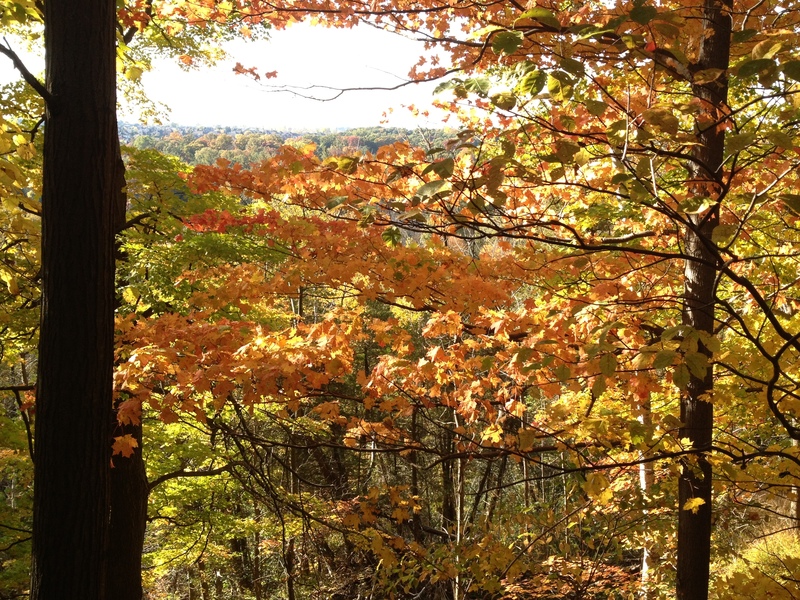 I agree, there’s much to be thankful for … family, the beauty and bounty of nature and the country we live in. Looks like a lovely Thanksgiving weekend spent with family and friends. Aren’t the colours glorious this time of year? We spent the weekend in Niagara on the Lake …and it was a little piece of heaven. I look forward to the day when I can spend time in one of my daughter’s kichen’s like you just did. Does she make many of your old family recipes? I love Niagara-On-the-Lake, and it’s too long since I’ve been there! I imagine it’s especially lovely this time of year. It’s lovely to have grown children who like to cook. All my children know their way around the kitchen, especially the girls. My younger daughter in particular likes to make soups that we made together a lot when she was at home. It’s gratifying to see her commitment to providing her children with nutritious meals made from whole foods.